Drawing Dry Pastels Charcoal on 100% Acid Free Reg Paper | 21" x 28"
Prints Etching on Canson Paper | 4.5" x 6.5"
Prints Etching on Canson Paper | 13" x 9.5"
Prints Etching on Canson Acid Free Paper | 5" x 7.5"
Mixed Media Acrylic Mixed Media on Canvas | 10" x 12"
Mixed Media Acrylic Mixed Media on Canvas | 30" x 24"
Mixed Media Pen and Ink Mixed Media on Canvas | 10" x 8"
Mixed Media Acrylic Mixed Media on Canvas | 48" x 60"
Mixed Media Mixed Media Wood on Acrylic Sheet | 30" x 42"
Mixed Media Mixed Media Wood Woodblock on Mount Board | 44" x 32"
Debabrata Biswas (b.1977) EDUCATIONAL QUALIFICATION 1996-97 Master in Fine arts (Distinction) Indian music board, Kolkata. 1990-95 Bachelors in Fine arts (First Division) Indian music board, Kolkata. SOLO EXHIBITIONS 2016 -ICONART gallery, Hyderabad. 2015 - Beyond Coffee, Hyderabad. GROUP EXHIBITIONS Ailamma Art Gallary, Hyderabd State Art Gallery, Hyderabad Pegasus art gallery, Hyderabad Karnataka Chitrakala Parishath, Bangalore Tamkanat Art Gallery, Hyderabad Daira , Hyderabad Beyond coffee, Hyderabad Milani Hall, Jamshedpur AWARDS/ HONOURS 2007- Award, Animation Direction - WB solutions, Hyderabad 2005- Award, Trainer, DQE, Hyderabad ABOUT THE ARTIST Debabrata Biswas is a know Bengal school trained and Hyderabad based artist. He was born in 1977 in Jamshedpur (Jharkhand). He obtained Bachelor & Master both degrees in Fine Arts from Indian Music Board. Kolkata. He received Diploma in Fine arts from Tagore society, Jamshedpur. He has received several awards in painting in school and college level. 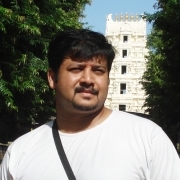 He has received Animation Director Award from WB solution, Hyderabad and Trainer Award from DQE (2005/2008). Debabrata Biswas had a two solo shows at Beyond coffee (art gallery) & ICONART Gallery, Hyderabad.